So I've been quite ill recently but have also had overtime at work, so have basically been running myself ragged and have been pushing myself a bit too much really! 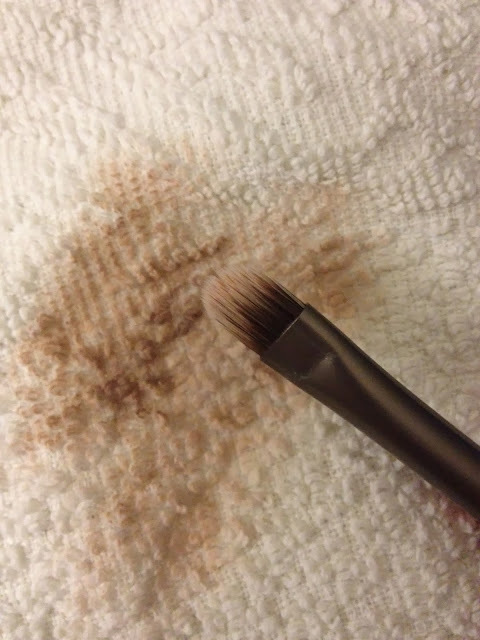 This does mean that my makeup brushes needed a good clean (ewww! Germs!) but that I was too tired to bother to stand at a sink and shampoo them all back to freshness (ah....laziness!) so I decided to pick up the new Dior Brush Cleanser. I'd already used this on the Dior counter next to mine so I already knew what to expect and was really looking forward to trying it out on my (pretty makeup heavy) ones at home! Firstly, let's talk packaging. As always with Dior, it's sleek and classy without being too over the top. I'm loving the silver design and it looks pretty damn fancy on my set of makeup drawers! Here it my pretty gross looking lip brush. I'd already stupidly left some pink lipstick on here ages ago and it had stained it a little bit anyway. Anyway, you can see I've clearly used this a lot and not cleaned it....for I am a disgusting person! Haha! 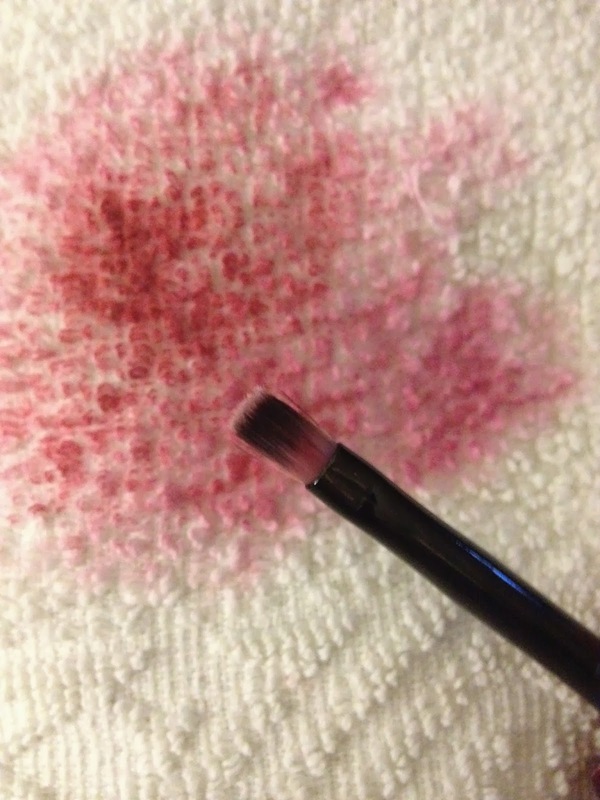 Here is a beautiful shot of my using the brush cleaner. It has a pump action on it rather than a spray, which actually means you get your brushes clean quicker and you use less product I think. 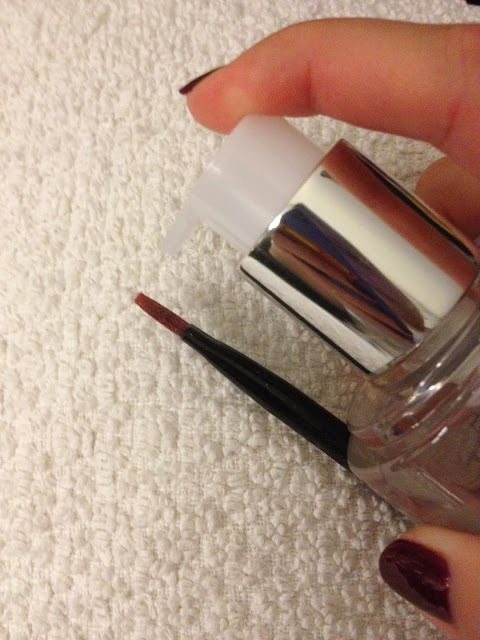 It says on the packaging that you should use one pump on a clean bit of tissue and wipe your brush on that, but having spoken to my friend who works on Dior she said it was fine to pump the cleaner onto the brush and wipe it after that, thus saving you cleanser! 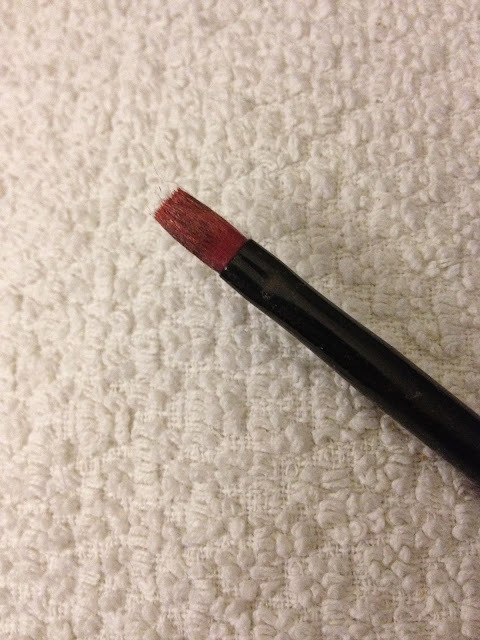 And here is a beautiful shot of my clean lip brush (well, as clean as it will get with the pink lipstick stains on it anyway!) I was actually a bit shocked with how much product came off it to be honest! UGH! How much eyeshadow was on there?! Good lord. I'd forgotten that it was actually white on the tips of this brush. Lovely... I did also try this with my big fluffy powder brushes but I didn't think anyone would want to see that many pictures of dirty/clean brushes....it does work really well on them though! 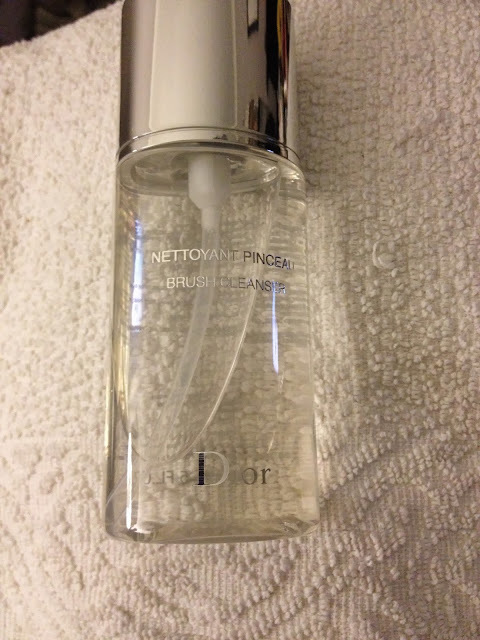 Overall, I absolutely love this brush cleanser and would repurchase it once I run out. I would still use my bareMinerals shampoo for a monthly deep clean but this cleanser is perfect for a daily/weekly hygiene cleanse. It's pretty quick drying too which is good as you can use it on brushes between looks if you need too. It's £14.50 for 150ml of product, which may seem steep to some, but I think it's worth it for such a good product. If however, your budget doesn't stretch to that price, I do also highly recommend the ELF Daily Brush Cleaner but I did find that I used this one up quite quickly as I needed to use more to clean my brushes than I do with the Dior one, but at £3.75 you can't complain too much I guess! (especially as ELF are having a 30% off everything at the moment!) I would personally still pick the Dior one because I prefer the application and the formula, plus the drying time is much quicker. What do you guys think? (don't be too mean about my gross brushes! Haha!) What do you use to clean your brushes? Sounds like such a great cleaner. I'm currently using my Clinique brush cleaner but I really need to repurchase some more. Keeping a look out for the Dior and Elf cleaners. what are the ingredients in this cleanser? I was recommended this product by a sales assistant, after I complained that I was always washing my makeup brush. 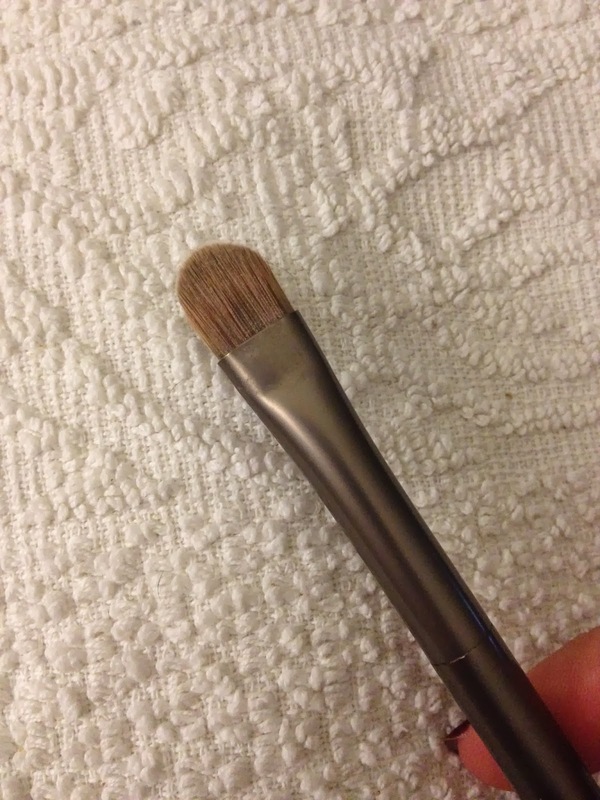 The cleanser is quite effective for cleaning the brush if used after each application of makeup. Read about the MoomooBaby Triple Brush Set reviews. Thanks!